Welcome to Dream A Dream Kennels an exclusive mini Dachshund Facility located just outside Austin, Texas in a cozy little German town called Pflugerville. At Dream-A-Dream Kennels, we offer a “Home away from Home” specifically designed for your Dachshund. Our unique approach to boarding, allows you to relax with the knowledge that your Dachshund is in great hands while you are away! After 15 years of offering exclusive boarding services to “our” Dream A Dream Dachshund families, we are excited to expand our boarding services to include your wonderful canine family member. All new customers and previous customers with changes to address or email please fill out a BOARDING CONTRACT. In addition all customers must fill out your pets CHECK-IN INFORMATION FORM prior to your arrival. If you have any questions regarding our boarding services, please call contact us. Here at Dream A Dream we offer many options for you & your Dachshund. 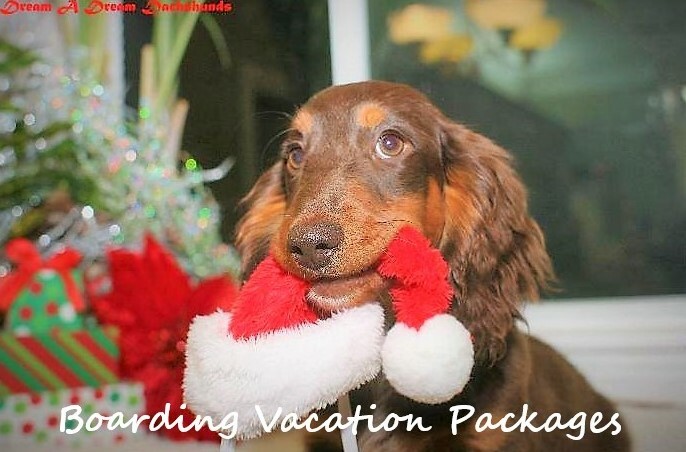 Vacation Boarding accomadations, Dachshund Fat Camp, Conformation Show Potentials & puppies that not only love to be couch/lap partners but true to the breed hunting field partners. © Dream-A-Dream Dachshunds 2015. All rights reserved.